Buy ACRONYM a Coffee. ko-fi.com/acronym - Ko-fi ❤️ Where creators get paid by fans, with a 'Buy Me a Coffee' button. 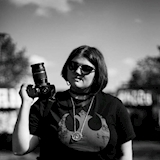 I am a photographer and journalist in Detroit, specializing in portraiture, brandable content, and writes Arts, Entertainment, and Business/Tech media. Thanks for checking out my Ko-fi page! If you're digging the content, buy me some coffee! We all know how much coffee I drink (it's disturbing). Secured Payments. Support goes to ACRONYM's account. Upgrade ACRONYM to a yearly Gold Membership with a one-time payment.